Having been in the field of gate repairs for more than a decade, our Hoffman Estates based local technicians can handle any gate related repair or installation job. If you've got an automatic gate that needs troubleshooting or upgrading, we're here to help! If your gate has stopped functioning altogether, you'll probably need assistance as soon as possible. If you let us know it's urgent when you call, our technicians will get to you as soon as we can. Whatever the brand, model or size of your automatic gate, swinging or sliding, we're confident that our experts will be able to repair it. We specialize in troubleshooting remote gate controls and can restore any defective controls. If your gate isn't responding, it could be that a control circuit or sensor has become faulty. Alternatively, it could be that your system needs to be reprogrammed. Our team will get to the bottom of the problem and resolve it for you. At the end of a job, we'll test your gate and ensure there are no underlying safety concerns. We'll also make sure never to compromise the security of your system - if there is some security glitch that isn't working, the job won't be done until we've fixed it. If your gate is a rolling or sliding one, the wheels and rollers will naturally be very essential for its proper functioning. If the wheels or rollers break, the movement of your door will become hindered or may stop altogether. This is a fairly common problem that our team can definitely help you with. We'll replace the broken components for you and ensure your gate starts to operate smoothly again. We believe we have some of the most experienced technicians in the Illinois area. 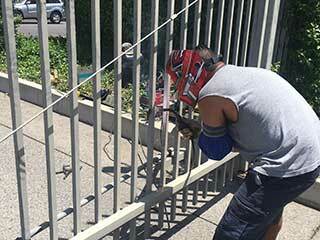 To book an assessment and repair job for your automatic gate. simply get in touch by phone or book an online appointment through our scheduling system. Our team will be happy to hear from you!